Nokia announced that its highly anticipated N8 smartphone started shipping this week, amid reports last week of delays in shipping the device to those who preordered the phone. The N8 is Nokia's latest attempt to regain its share of the smartphone market lost to the iPhone and Android phones, but the device has several shortcomings that would put off prospective buyers. The N8 is Nokia's flagship device, and it took its sweet time to arrive on the market. It was announced in April, and took almost six months to move to shipping status, eons in the world of technology. During this time, we have seen a new iPhone, several highbrow Android phones, and a flagship BlackBerry phone (see how they all stack up against each other). Now, finally arriving in the hands of those who preordered it, the N8 will have to prove whether Nokia still has the edge in the smartphone market. But just like every other phone out there right now, the N8 packs a punch, yet it has some pretty damning shortcomings. Let's explore both. It's underpowered: It runs on a 680MHz ARM 11 processor, which is behind with the times compared to most high-end smartphones the N8 is competing against, which have 1GHz processors. The N8 also comes only with 256MB of RAM memory, compared to double this amount on the iPhone 4, Motorola Droid X, or the T-Mobile G2. The slower processor coupled with the lower amount of RAM can make the N8 slow and unresponsive when demanding applications are run - which leads us to problem no. 2. 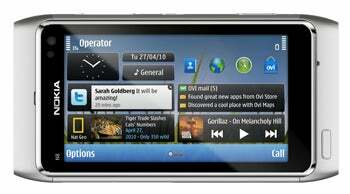 Symbian^3 is no match to iOS and Android: The OS was not designed with touchscreen use in mind, and it deeply rooted in the times when smartphones had a numerical keyboard and a couple of feature buttons. When it started launching smartphones with touchscreens, Nokia tried to revamp its OS, and bring it up to date. The N97 was one of the first attempts, which wasn't very well received, and early hands-on reviews of the N8 with Symbian^3 are not favorable either. As for apps, the Nokia Ovi store has around 5,000 apps working with the N8, whereas the iOS App Store is host to more than a quarter-million apps, and the Android Market to almost 100,000. You can't get it cheap with a contract: Nokia did not secure deals with U.S. carriers to subsidize the price of the N8, so you can't get it in the $200 range with a two-year plan, as with all the other top-end smartphones out there. Instead, you will have to pay around $550 for a N8, and then use your current AT&T or T-Mobile plan with it, and there's no Verizon or Sprint version of the N8 at the moment. It has a great camera: 12-megapixel Carl Zeiss optics with autofocus and Xenon flash is enough to make any iPhone user green with envy. It can also shoot HD videos (720p@25fps), and uses geo-tagging for your photos, it has an ND filter, and face and smile detection, too - you might as well just put your compact camera up for sale on eBay. Oh, and there's a front-facing camera for video chat as well (VGA 640x480 resolution), plus a dedicated camera button on the side. HDMI and FM goodness: When it comes to playing the HD videos you shot with the N8, the phone has miniHDMI-out and composite capabilities, and it can output Dolby Digital Plus via HDMI. Music lovers will appreciate that the built-in FM radio tuner can also transmit music on the phone (to use for example wireless in your car). The phone also comes bundled with all the cables and adapters you need to connect it to your TV or stereo set, which is always a plus. Free GPS navigation: The N8 comes bundled with Nokia's Ovi Maps GPS navigation software, which unlike the system Google bundles with Android phones, has all the maps preloaded, so it's not entirely dependent on 3G reception. Does the Nokia N8 get the thumbs up from you, or is the iPhone and Android phones more up your street? Sound off in the comments.